“Winnie the Pooh”, a Two Beans Production is a great opportunity for people of all ages to come together and have fun. The show takes place on November 10 at 2pm. This show has all the kids excited in anticipation of seeing all their favorite Pooh characters. Junior Anne Kusy can’t wait for the day to arrive and says "I definitely would be interested in seeing the play because my parents used to read the books to me when I was younger,"
The play is based on A.A. Milne’s original stories and not on the Disney version of Winnie the Pooh. 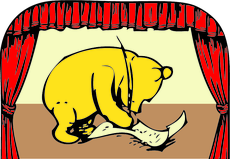 The play consists of 4 short stories from the books written by Milne, namely “Pooh and Piglet Go Hunting,” “Eeyore Loses a Tail,” “Eeyore Has a Birthday,” and “Kanga and Baby Roo Come to the Forest”. A large part of the songs that will feature during the show have been picked straight from the same original stories. The origin of Winnie the Pooh dates back to the time when Milne wrote these stories for his son Christopher Robin Milne. Christopher received a stuffed bear for his 1st birthday and it is from here that Milne drew inspiration to write stories for his son and included his other toys as part of the famous stories.